And I've enjoyed them all. So today I'm delighted to welcome him to my blog, where we can sit chatting over virtual coffee and virtual gluten-free cookies. Find a mug and a plate and sit with us. Thank you for inviting me to participate in an interview for your blog! My pleasure. When did you start writing stories? When I was a child, I was sick with allergies and asthma. I spent a lot of time home by myself because my parents both worked. I read, and created make-believe worlds with various animal friends. Later, I started writing for my high-school newspaper. That led to a career as a journalist, writing for newspapers, magazines, radio and a little television. The natural progression from there was writing novels. I remember when I had mumps as a child I made models of dinosaurs and built a world for them to enjoy their adventures. But that was long ago. What was your route to publication? I started out the same way I think many novice writers do: submitting my novels to agents. I had a few bites early on, but they all suggested changes to the stories that just didn’t feel right to me. I finally decided to stick to my own words and publish myself. I tried that same route. All the agents I spoke to wanted me to stick to one genre but then I'd have to stop writing in all the others. You write in several different genres too don't you. What influences your choices of what to write? Yeh, I’ve often been criticized for not sticking to a single genre. I can’t help it. I love history, I love stories about people interacting with history. I’ve written a love story about World War Two, a novel about Paris in the 1920s, and a science-fiction novel about a planet whose biggest industry is making babies. 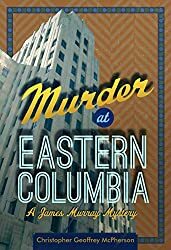 I had the most fun with my five-novel series called “The James Murray Mysteries” which combined my interest in historic Los Angeles with so many of the influential events of the 1930s: prohibition, the Depression, fashionable department stores, early filmmaking, the rise of Nazi Germany, Hollywood personalities, and the start of women striving to stand alone without the need to be defined by the men in their lives. I really love those books! I love your most recent book too, “22: The Biography of a Gun,” but it's unlike anything you’ve written before. How did that come about? I was watching an Italian movie about a woman engaged in an illicit love affair. At the end of the film, she leaves the apartment of her lover and begins walking down the street. I thought how much more interesting the ending would have been had she been shot and killed in a drive-by shooting. At that moment, a novel was born. I decided to write a novel about a woman accidentally killed by a gun, and then follow the path that gun took as it went in and out of the lives of other people. Many of the stories are loosely based on real-life events, such as that news reporter killed on air by a disgruntled co-worker and the child who found a gun hidden behind a television set. That gun is almost like another character in the novel. Are you a big fan of guns? No. Absolutely no. I’m terrified of the mere thought of them. When I was doing research on this novel, I was talking to a police officer. He offered to take me to a shooting range and show me how to shoot. I declined. He offered to let me hold a gun and I refused. 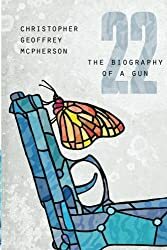 Writing “22: The Biography of a Gun” was some kind of catharsis for me, dealing with my terror of guns out in the wild. When we were house-hunting we found a gun in a kitchen drawer. Like you, we neither of us wanted to touch it. So, changing the subject, your books have really great covers. How important do you think a good book cover is? Thank you for your kind words. I must take a moment to thank my cover designer, my husband, Matt, who is a professional graphic designer. 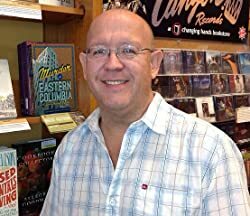 He’s been responsible for the covers to all 15 of my books, and started a side industry of eBook-cover designs for which he’s won a couple awards. The cover design is the most important element of the book, after the writing itself. As you know, a cover can make or break a book. Despite warnings to the contrary, people always judge a book by its cover. With thousands of books being published every day, there’s really no way around it. The best advice I can give an author about designing a cover is leave it to the professional. I discuss my ideas with Matt and let him go to it. He never fails to come up with something so much better than I could ever have imagined. What about those dreaded back-cover blurbs? How hard are they to produce? They are killer, aren’t they? I often spend hours writing and rewriting trying to distill an entire novel into a few hundred words. I’ve never been completely satisfied with the results, but you have to stop at some point and just publish, don’t you? Indeed. Otherwise I wouldn't get to read your novels. What will you write next? Oh, this is the fun part. I’m about a third of the way through my new novel about the very first cat in Japan in the 10th century. She has some amazing adventures to share with her readers. I’ve really enjoyed the research I’ve done on this one. The first cat in Japan? I think I'm hooked already. Looking forward to it. Thank you for (virtually) meeting with me. I've really enjoyed learning more about you and your books... and I really do love your books. Sheila! I had fun with our interview! Thank you for your support.